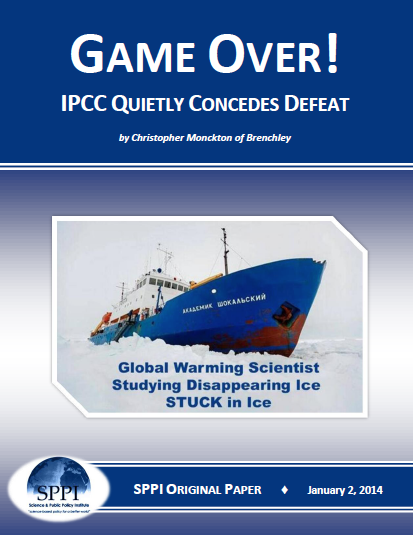 A new paper from SPPI and Christopher Monckton shows how the IPCC has quietly conceded defeat, that it's models projecting catastrophic doom from anthropogenic global warming have been falsified in the face of real-world observations. "the IPCC has quietly, furtively, but very definitely capitulated in the face of the real-world evidence that the models have failed." "The IPCC’s explicit reliance on its own “expert assessment” rather than upon the models’ projections is a significant climb-down." The IPCC has quietly, furtively, but very definitely capitulated in the face of the real-world evidence – first revealed here at SPPI – that the models have failed. 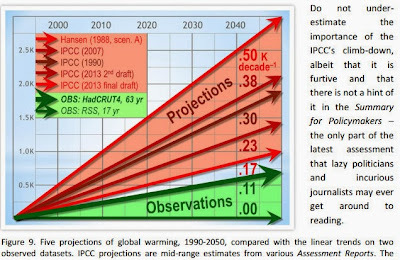 The IPCC’s explicit reliance on its own “expert assessment” rather than upon the models’ projections is a significant climb-down. Despite record increases in CO2 concentration, there has been no global warming for almost 13 years, or, by satellite measurements, for more than 17 years, and no warming distinguishable from the combined measurement, overage, and bias uncertainties for 18 years. Multiple lines of evidence now confirm that the models and consequently the IPCC have overestimated global warming. yet neither that misconceived organization nor any of its host of unthinking devotees has displayed any remorse. ‘is it his science background as science advisor to Margaret Thatcher…[er, NO!] is it the fact that he wrote several peer reviewed scientific papers…[er, NO! ]…if he was Margaret Thatcher’s science advisor…lets check her autobiography to see what she thought of his advice…no her science advisor was George Guise…no Margaret Thatcher said George Guise advised her on climate change…which she set up the CRU [at East Anglia University]…etc. ‘between co2 concentration and temperature going back 600,000 years in the past [he means 600 million years] and here we have 7000PPM…[it is very easy to see where he went wrong]. ‘It’s a favourite tactic of anybody who wants to undermine scientists, compile a list of quotes usually from scientists and usually taken out of context, Monckton does this of course, but goes a step further and changes it! Ad homs against Monckton do not invalidate any of the claims he makes which are the subject of this post. Do you have anything to say about the topic of this post instead of ad homs? What specific & scientific claims do you have regarding this post? Apparently none. A simple gaffe during an off the cuff speech is something anyone could make, yet warmists like yourself don't mind when Michael Mann has continued to use upside-down data for the past decade and refuses to admit his published egregious error for more than a decade after it was pointed out to him. AGW is a religion and egregious mistakes of the priests don't matter, only ad homs against non-believers matter. In the same video you also make the pathetic mistake of equating the 'greenhouse' effect to the limitation of convection. That's when I stopped watching and will not waste any more time debunking your videos. Ah yes. You know the person posting has ZERO behind their argument, when they have to resort to making fun of a disfigurement caused by a life-threatening illness. That's been most of my experience with True Believers. We listen to him because he makes points which are verifiable, not because he claims any authority. In fact he is the first to argue AGAINST authoity arguments. Your ad homs might be great fun for you but even if they were true they are irrelevant. None of Mann's claims are verifiable. 97% of climate models and climate scientists predicted significant global warming over the last 15 years....and were wrong. One of the key arguments about AGW has been a tipping point in temperature. Despite years of additional CO2 buildup that hasn't happened. I looked at it from the view point, and after much argument, still come back to solar cycles. Research is woefully lacking in a number of other areas. According to me, we are on the edge of a major cool down which will affect everybody. If it has been the objective of the IPCC to leave the world with no options in a colder world and billions of us die, then they have won. They 've won by time consuming debate about a made up crisis. With any body that thought differently was "mentally deficient", "on the payroll of some organization", and "plain out lying". The lengths AGW have gone to discredit is extraordinary. Whatever the arguments, the entire debate in my opinion has come down to one word, "retained". Without any science other than CO2 is a greenhouse gas, the heat that is released in upper atmosphere is "retained". That's their statement. I say it's "released" and although there is probably is and always has been some retention, certainly not overwhelming or enough to cause a tipping point. So what is the refraction index of the upper atmosphere? And if there is an increase to cause the IR to be refracted back is it doping from a rare earth compound? Like the composition of a passing comet or meteorites. I have a ton of questions. Another point I'd like to make is the math they use to come up with the global rise in temperature. I can use the same sort of math to come up with a +0.5 C in temperature with the decline of the magnetic field of the earth. ( around 10% decrease. And as AGW has pointed out, repeatedly, a small amount can have a huge impact. So what does a 0.05 decrease in Gauss have over the entire surface of the upper atmosphere? On frequencies other than in the nanometer range. Like those in the microwave range which are directly affected by magnetic fields. Which by the way, there is one frequency that directly heats water, can't cook in your microwave with out water) Especially over time. The decline started about the same time as the industrial revolution. So with a big enough stick can I beat everybody's head into believing that it's really what I say it is? The very dangerous thing that I believe that the IPCC has done is to take honest scientific debate of the table. When there is a real crisis and it is verifiable, no one will either believe it or act on it. It has nothing to do with whether I believe in the laws of gravity or evolution.